Pre-concert Reception at 6:30 PM / Concert at 7:00 PM. NOTE: Concert Tickets are available online or at the door, and Gourmet Tickets are only available online. 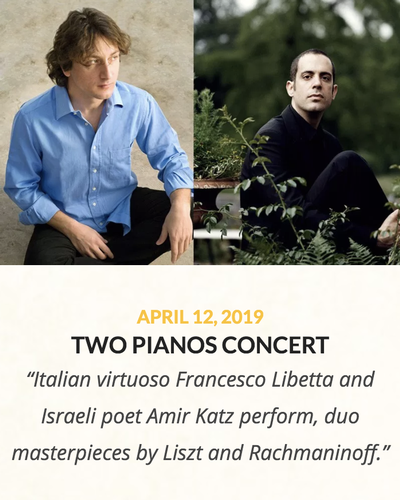 The first performance will be showcasing the duo: Two Pianos Concert with Francesco Libetta and Amir Katz. There are two ticket types available for purchase: Concert Ticket: admits one adult or child to the concert only. Gourmet Ticket: admits one child or adult to the concert as well as a gourmet tasting & prosecco reception provided by Puntino Key Biscayne at 6:30pm (before the concert).